Half-eaten fruits and veggies have a knack for disappearing into the depths of our refrigerators and reappearing when they’re wilted and unappetizing -- fit only for a trip to the compost bin. Hutzler has developed a way to keep fruits and veggies fresh and easily identifiable. This family-owned and operated company has been manufacturing housewares in the U.S. since 1938, when Lothar Hutzler started the company after emigrating from Germany. Its Saver line of kitchenware is made from BPA-free polypropylene or polystyrene, and each airtight container is shaped to look like the food it stores. A cut tomato will stay moist inside the Tomato Saver, for instance, and a garlic bulb will last longer if it’s inside a Garlic Saver. Each two-piece container goes together with a twist lock, so the contents stay fresh and odors aren’t released into the refrigerator. Hutzler Savers also work great as serving containers for cut produce at a salad bar or for arranging hamburger toppings at your next barbecue. 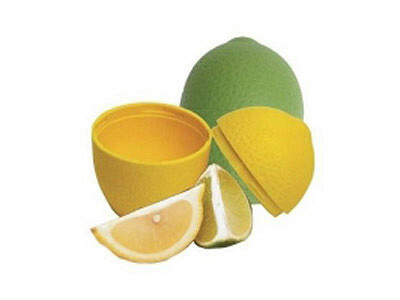 The Lemon/Lime Saver is perfect for keeping citrus twists handy at a cocktail party. You can’t miss these colorful forms, in the fridge or on the buffet table. Hi Everyone! So glad to have our Food Savers featured as today’s Daily Grommet! I’m Monique Haas and my company, Hutzler Manufacturing, created the Food Saver. We love freshness (oh, behave…) and we found a way to keep your cut fruits & vegetable fresh longer. Our bright produce shapes won’t get lost in a crowded fridge and are also fun for serving. If you have any questions or comments, please share them. I’d love to chat with you. Hey Monique...it's kind of quiet here today...people are too busy buying their Food Savers and I guess they don't have any questions just yet. But I wanted to tell you how much I appreciated the family business story and the snippets of history you shared. I guess innovation and invention are in your blood. Congratulations on another advance. Thanks so much, Jules. We always have so much fun dreaming up new products that are not only useful, but a whole lotta fun! If anyone has any questions, I would love to answer them. HI, Monique. I love these products! I already have all of them. They are wonderful! I just wish y'all made one for cucumbers. I am constantly putting them in sandwich baggies but would love a cucumber saver to go along with all of my other food savers. Thanks again for a great product! So nice to hear, Billie. Thank you. We do have a number of new Saver designs coming out in the next few months, although a Cucumber Saver is not one of them. Perhaps that will be one for the next round of designs. Thanks so much for the great suggestion! @Josie: You're right, our math isn't so good! Thank you for pointing that out. We've made the adjustment so that it comes out the same. If you are ordering five, it's easier to choose the Set of 5 option so that you can add them into your cart in one step. I'm curious if this plastic is free of BPA and other chemicals that might leak into your fruits/vegetables. I've grown increasingly more concerned about storing my food in plastic containers. @Lyzz: Yes, it is made of BPA-free Polypropelene. There is no option to buy the pepper container in the set! 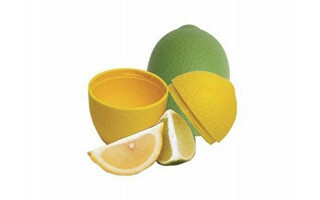 The same 4 options show up---garlic, lemon, lime and onion. @Joan Marcus: Unfortunately, the pepper containers are sold out. Is it ok to put the onion keeper in the dish washer ? @Gloria: It is dishwasher safe. Half-eaten fruits and veggies have a knack for disappearing into the depths of our refrigerators and reappearing when they’re wilted and unappetizing -- fit only for a trip to the compost bin. Hutzler has developed a way to keep fruits and veggies fresh and easily identifiable. 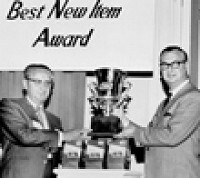 This family-owned and operated company has been manufacturing housewares in the U.S. since 1938, when Lothar Hutzler started the company after emigrating from Germany. Its Saver line of kitchenware is made from BPA-free polypropylene or polystyrene, and each airtight container is shaped to look like the food it stores. A cut tomato will stay moist inside the Tomato Saver, for instance, and a garlic bulb will last longer if it’s inside a Garlic Saver. Each two-piece container goes together with a twist lock, so the contents stay fresh and odors aren’t released into the refrigerator.